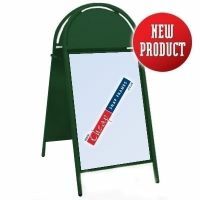 Cheap Snap Frames Ltd sell aluminium poster frames, display products, pavement signs, exhibition systems, notice boards, cable systems and acrylic leaflet sign holders - at superbly cheap prices. We have large stock levels so offer quick service on most items to the UK. We are an internet based company and don't have a retail outlet - this is to keep the costs low which we can pass on to you, and live up to our name of Cheap Snap Frames Ltd.